Cranberry growers in New Jersey are getting ready for the harvest season which is expected to start at the end of this month. Preparations and conditions have so far been excellent and growers are hoping for a good crop. All they need now are some cooler nights after the warm spell along the East Coast. "We expect to begin our harvest sometime towards the end of September," said Stefanie Haines of Pine Island Cranberry Company in Chatsworth. "October is the peak of the harvest before slowly winding down and ending in the first week of November. We are still waiting for the berries to size up as well as color before we can start, which will happen once we get a few colder nights." This year's cranberry crop is looking to be a good one. Some areas have been feeling the strain of oversupply in recent years, but New Jersey growers appear to be unaffected by this as the majority of their product is grown for the Ocean Spray coop. "It's not going to be the biggest harvest ever, but we are feeling confident that it will be a good year," Haines noted. "The majority of growers are part of the Ocean Spray coop and it's nice to work all together for the same purpose. It also means that we don't deal with the packing and shipping, although there are a few growers who do have their own packaging and have arrangements with retailers directly." Haines explained that one of the factors as to why the New Jersey cranberry industry is less prominent than in other regions is partly due to its geography, being the southern-most area that cranberries can grow. "In New Jersey, the sandy soil of the Pine Barrens makes a perfect growing region for which to grow cranberries, but it only covers a relatively small area," she said. "The cranberry business here is not a huge tourism draw. We don't generally have the site visits and tours as they do in other states so we concentrate on growing the berries for the coop and therefore it's considered more a niche crop for the state." New Jersey growers welcome trialing new varieties and technology to help improve their programs. Each year, several new varieties are tested, with the successful ones eventually being implemented into the permanent program. "Here at Pine Island, we've planted a couple of new varieties which we expect to pick for the first time this year," Haines shared. "One of these is named after my grandfather - the Haines variety, and was developed by Rutgers University. Over the last few years, we have also implemented a few new ways to process the cranberries once they are harvested. 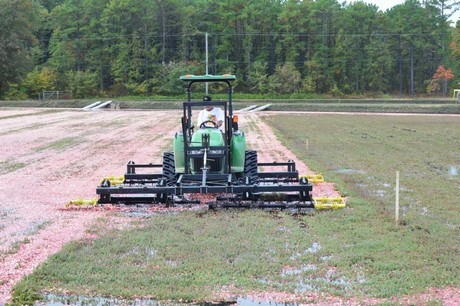 The cranberry harvest is our "Superbowl', and we are very much looking forward to the season."